I’ve discovered something very useful which I think will help mobile social tagging to really take off – Opera Mini Bookmarklets. I’m addicted to bookmarklets, which I use all the time in my web browser. If you haven’t tried them yet, give bookmarklets a whirl. They give you browser toolbar buttons that do all sorts of neat things with the web page you are currently viewing. Like searching Technorati, Bloglines or Google Blogsearch for blog items that refer to the current page. Or counting the number of characters in highlighted text on the page or viewing the page’s headers. There’s one particular bookmarklet that I use constantly. It adds the current page to my del.icio.us links. I store everything in del.icio.us. It’s a huge convenience to be able to add to and access my bookmarks from any machine. There’s no browser toolbar in Opera Mini so you store bookmarklets on the regular bookmarks page. 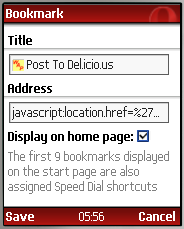 With the Advanced MIDP2 version of Opera Mini you can assign a bookmark to a hot-key so that keying *, 1 adds the current page to del.icio.us, for example. All phones have a limit on how many characters you can enter or edit in a text box. This can vary greatly. My Motorola i855 can only handle 200 characters but the Nokia 3650 can accept 5000. Some of the more interesting bookmarklets are well over 200 characters which may limit which ones you can use. In Opera Mini, bookmarklets execute on the server not the browser. This means that any references to the current page will be to the last page loaded from the server. When you hit the Back button the previous page is loaded from the local browser cache but the Opera server still thinks you are on the last page you loaded so bookmarklets will execute as if you were still on the previous page. The workaround is, after hitting Back, refresh the page with #,0 before using any bookmarklet on that page. Visit o.Yeswap.com in Opera Mini and click on any of the links. When the page reloads, press # then 7 (or Menu|Tools|Add Bookmark) to bookmark the page. On the Opera Mini Add Bookmark page (image) change the bookmark’s title to something meaningful. So now that you have a bookmarklet or two in Opera Mini how do you use them? It’s really very simple. When you are on a page that you want to add to del.icio.us for example, press the # key followed by the 2 key which will bring up the bookmarks page. Then select your Post to Del.icio.us bookmarklet and press OK. You will be taken to the Delicious Add page with the Title and Description fields already filled in (you might be prompted to log in to del.icio.us first). Enter a tag or two and press Save. So how to add your own bookmarklets to Opera Mini if you don’t have a web page? It’s pretty easy to do using del.icio.us Here’s the process step by step. You need to create a link somewhere on the web that you can access from your phone. Del.icio.us is ideal for this because it’s free, available and easy to use – but you can create the link anywhere, your blog, MySpace, Yahoo Bookmarks etc. These instructions assume you are using del.icio.us. Create a del.icio.us account if you don’t already have one. Press Save, then fill in the Description and optionally the Tags field. I recommend using the tag minibookmarklet to make these tags easy to find and share. Bookmark the page in Opera Mini and edit the bookmarklet as described above. If you find or write any bookmarklets that are useful and work in Opera Mini, drop me a comment and I’ll add them to o.yeswap.com. This entry was posted in Browsers, Mobile Social, Opera Mini, Search and tagged bookmarklets, Opera Mini by Dennis Bournique. Bookmark the permalink. To make links in a comment use an HTML anchor tag. Save (or Print to bluetooth printer) directly from opera mini!!! Its about time seomnoe wrote about this. Exretmley helpful article, please write more. Hello! Thats a wonderful trick! Thanks for that. But could you be so kind and have a look at diigo.com, its a bookmarking service. I was not able to make it work. Dennis, Just want to let you know superscreenshots site has been down for a while now,hence the bmarklet and link on o.yeswap is useless,any others you know of ? Thanks for letting me know. I’ll try to find another screen shot service and create a bookmarklet for it. Hi. I’ve tried to use the screenshot bookmarklet with Operamini 5.1, but all I get is a countdown screen saying there are over a thousand screenshots in the queue. It doesn’t seem to work. Thanks for the heads up, I’ll see if I can find a replacement screenshot site.